Fruit waste, it’s a rampant problem. Yet, a group of EARTH University students sees it as an incredible entrepreneurial opportunity. 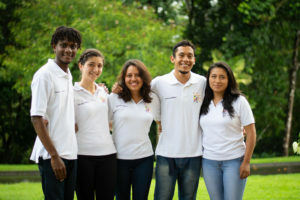 Recognizing the potential to extend the usable lifespan of diverse fruits via dehydration, the Class of 2020’s Melanie Pérez Vargas (Costa Rica), Natacha Rivera Aguirre (Ecuador), Janeth Ñauñay Ainaguano (Ecuador), Berson Valcin (Haiti) and Dennis Gutiérrez (Belize) founded a company called Sweet Energy. All EARTH students learn the ropes of planning, building, operating and closing a small business during their first three years on campus. The endeavor serves to stoke the students’ entrepreneurial spirit, grow vital business skills, inspire collaborative problem solving, and teach each how to harness the power of business to generate solutions to pressing social and environmental issues. In the case of Sweet Energy, the five young people uncovered the opportunity while engaged in community service. Working side-by-side with small-scale farmers, they discovered the inordinate number of perfectly edible papayas, pineapple, bananas and more being discarded solely for their appearance, for consumers’ aversion to buying such ugly fruit. Sweet Energy’s social mission creating more value for small producers’ efforts by securing them a new revenue stream for food that would otherwise be left to rot. The quintet’s hard work earned them the opportunity to present their social enterprise to IRUDESCA, an initiative among various Central American universities that evaluates social-impact projects based on innovation, regional scalability, and sustainability. The team was awarded with a paid internship at the Universidad de El Salvador. 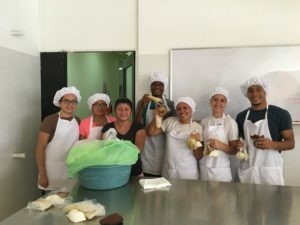 They spent three weeks representing EARTH, while learning about marketing techniques and business models from leading faculty in El Salvador. The experience enabled them to devise new ideas for improving and expanding their own business – ideas they plan to implement over the coming weeks. For more information about Sweet Energy, please visit the team’s Facebook page.